GF DMX512 remote control led wristbands are great for night events including concert, carnivals, sporting events, party, night club etc! GF led wristbands controlled by industry standard DMX512 protocol lighting controls, allow you to generate 12 light colors and flashing modes in a variety of special effect patterns and make every member of the audience part of the lighting palette at your event. The led wristbands also can be divided to several groups, you can choose control any of the groups or all led wristbands. Now you can engage your audience more deeply by making them part of the show. Besides, the GF DMX512 remote control led wristbands has super DUAL function, during the events, you can choose control them by the remote controller, when the events end, the audience can take them away and active it by press the button. For other competitors , if the remote control led wristbands without controller , you can do nothing ! The GF DMX512 remote control led wristbands come with 2pcs replaceable CR2032 batteries, can last 10-12 hours on continuous work , and the batteries can be replaced easily. It will light up your whole party, never need worry about the batteries run out of power during the event. What about the wristbands size? No need worry about the size at all ! GF DMX512 remote control led wristbands are made of flexible silicon band, one size fits all, soft and comfortable to wear on. Need brand your logo on the wristbands for advertising ? Easy, we can do it ! What is the working distance? How many wristbands can be controlled by one controller? The working distance is over 1000m , you can control over 10000 wristbands meanwhile. This is enough for a standard event. 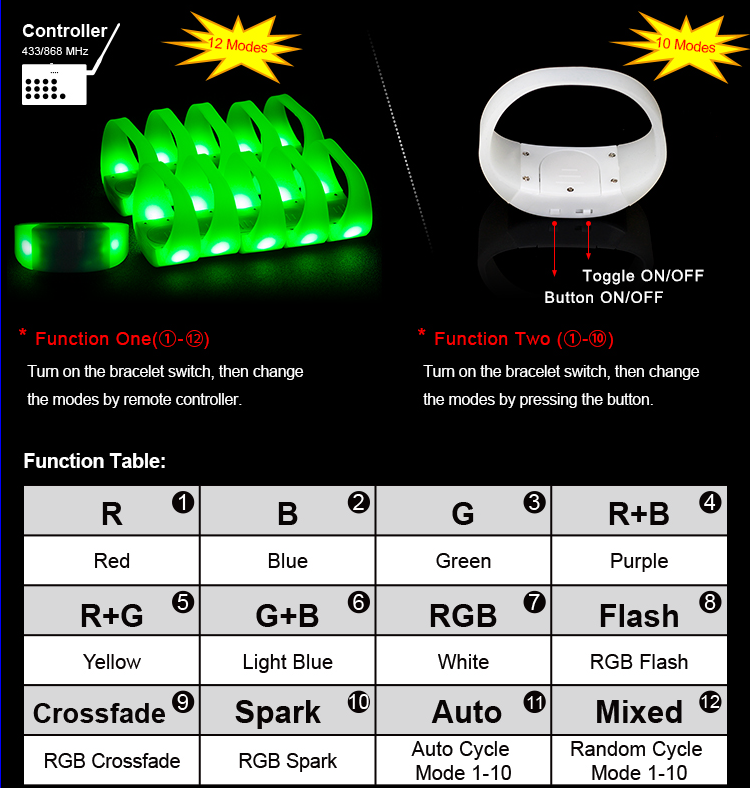 Main advantages of GF DMX512 remote control led wristbands: DMX controllable , group control, dual functions, 7 colors, 5 flashing modes, strong batteries, far remote working distance, large controllable quantity ,customized logo, comfortable material. Any interest, welcome contact us for more details.